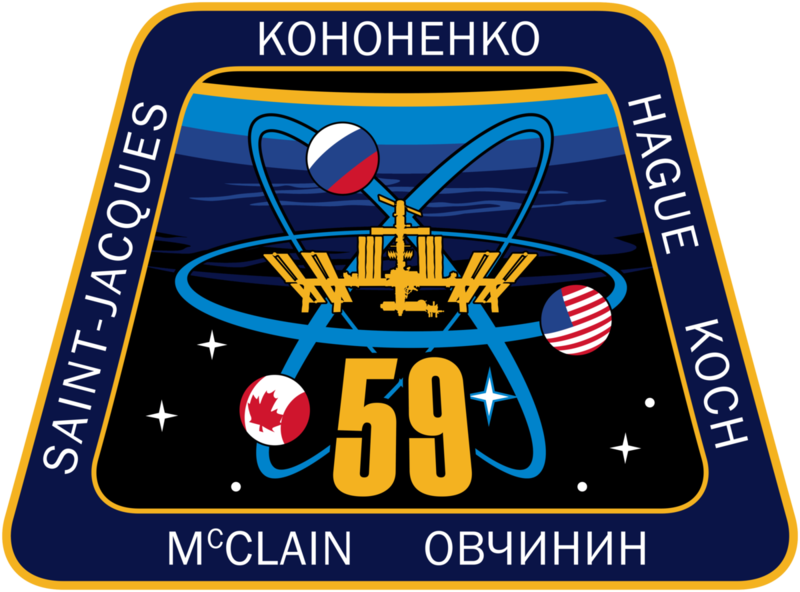 ISS - Expedition 59 Mission patch. Image above: The Cygnus spacecraft from Northrop Grumman approaches the International Space Station for a robotic capture. Image Credit: NASA TV. Image above: April 19, 2019: International Space Station Configuration. 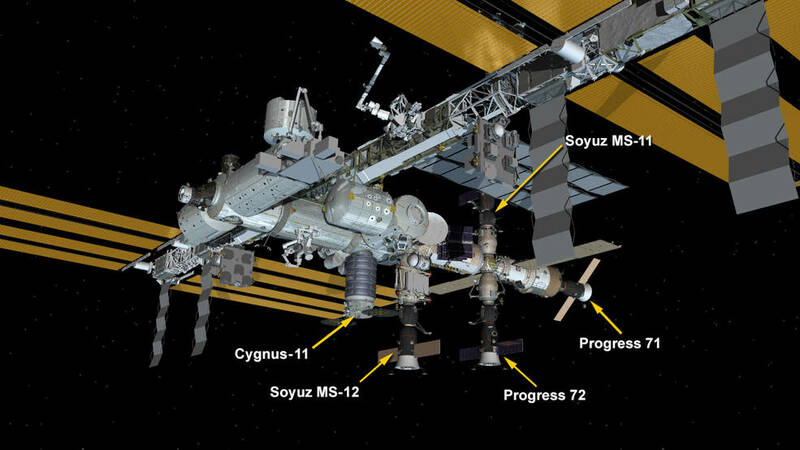 Five spaceships are docked at the space station including Northrop Grumman’s Cygnus space freighter and Russia’s Progress 71 and 72 resupply ships and the Soyuz MS-11 and MS-12 crew ships. Image Credit: NASA. 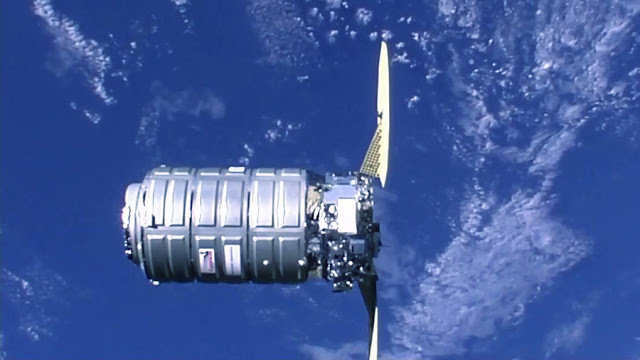 After its capture this morning at 5:28 a.m. EDT, the Northrop Grumman Cygnus spacecraft was bolted into place on the International Space Station’s Earth-facing port of the Unity module at 7:31 a.m. At the time of installation, Cygnus was flying 255 miles above the Indian Ocean just south of Singapore. Advanced Colloids Experiment-Temperature-10 (ACE-T-10) will test gels in a microgravity environment. 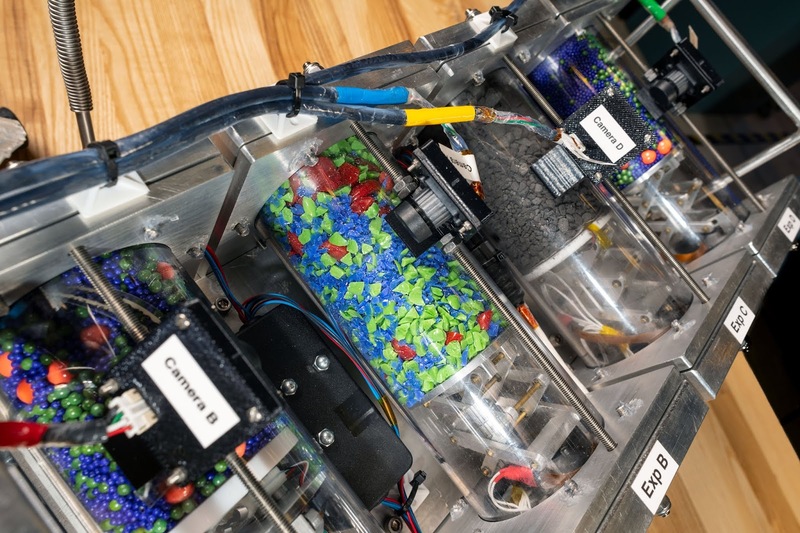 This research could aid in the development of increasingly complex materials that may serve as the building blocks for a range of applications on Earth including foods, drugs, and electronic devices. The process also may provide an efficient method to build new materials and equipment in space. Although the space station is well equipped for health and life sciences research, the equipment available for cellular and molecular biology still is limited compared to capabilities found in laboratories on Earth. 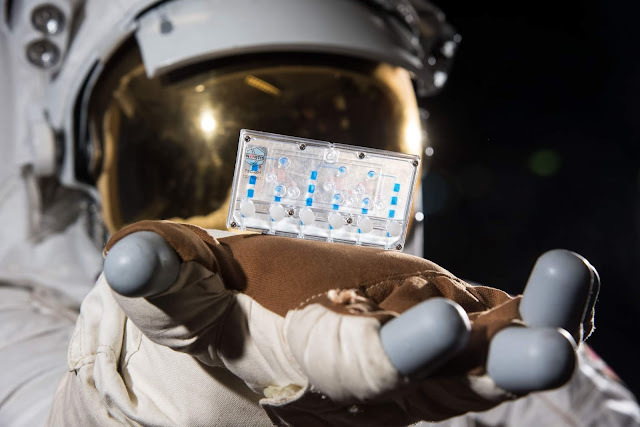 To address this limitation, CSA designed Bio-Analyzer, a new tool the size of a video game console that astronauts on station easily can use to test body fluids such as blood, saliva, and urine, with just a few drops. It returns key analyses, such as blood cell counts, in just two to three hours, eliminating the need to freeze and store samples. The Vascular Aging investigation uses ultrasounds, blood samples, oral glucose tolerance tests, and wearable sensors to study aging-like changes that occur in many astronauts during their stay on the space station. It’s one of three Canadian experiments exploring the effects of weightlessness on the blood vessels and heart, and the links between these effects and bone health, blood biomarkers, insulin resistance, and radiation exposure. Increased understanding of these mechanisms can be used to address vascular aging in both astronauts and the aging Earth population. Spaceflight is known to have a dramatic influence on an astronaut’s immune response, but there is little research on its effect following an actual challenge to the body’s immune system. 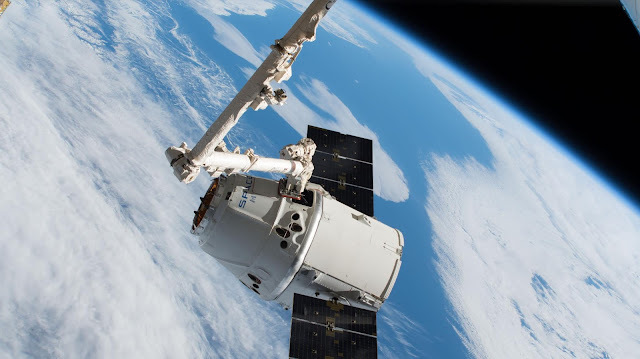 The rodent immune system closely parallels that of humans, and Rodent Research-12: Tetanus Antibody Response by B cells in Space (TARBIS) will examine the effects of spaceflight on the function of antibody production and immune memory. This investigation aims to advance the development of measures to counter these effects and help maintain crew health during future long-duration space missions. On Earth, it could advance research to improve the effectiveness of vaccines and therapies for treating diseases and cancers. A fleet of small robots is set to take on big jobs aboard the space station. Building on the success of SPHERES, NASA will test Astrobee, a robotic system comprised of three cube-shaped robots and a docking station for recharging; the first two are aboard Cygnus. The free-flying robots use electric fans for propulsion and cameras and sensors help them navigate their surroundings. The robots also have an arm to grasp station handrails or grab and hold items. Astrobee can operate in automated mode or under remote control from the ground as it assists with routine chores on station, and requires no supervision from the crew. This has the potential to free up astronauts to conduct more research. Images (mentioned), Text, Credits: NASA/Mark Garcia. CERN - European Organization for Nuclear Research logo. Image above: Tests being carried out on the superconducting power line. From left to right: Julien Hurte, Jerome Fleiter, Alejandro Zurita and Amalia Ballarino, the project leader. (Image: CERN). Like a metal python, the huge pipe snaking through a CERN high-tech hall is actually a new electrical transmission line. This superconducting line is the first of its kind and allows vast quantities of electrical current to be transported within a pipe of a relatively small diameter. Similar pipes could well be used in towns in the future. This 60-metre-long line has been developed for CERN’s future accelerator, the High-Luminosity LHC, which is due to come into operation in 2026. Tests began last year and the line has transported 40 000 amps. This is 20 times more than what is possible at room temperature with ordinary copper cables of a similar cross-section. The line is composed ofsuperconducting cables made from magnesium diboride (MgB2) and offers no resistance, enabling it to transport much higher current densities than ordinary cables, without any loss. The snag is that, in order to function in a superconducting state, the cables must be cooled to a temperature of 25 K (-248°C). It is therefore placed inside a cryostat, a thermally insulated pipe in which a coolant, namely helium gas, circulates. The real achievements are the development of a new, flexible superconducting system and the use of a new superconductor (MgB2). "The line is more compact and lighter than its copper equivalent, and it is cryogenically more efficient than a classical low temperature superconducting link that must be cooled to 4.5 K. Amalia Ballarino, the project leader"
Having proven that such a system is feasible, at the end of March the team tested the connection to the room temperature end of the system. 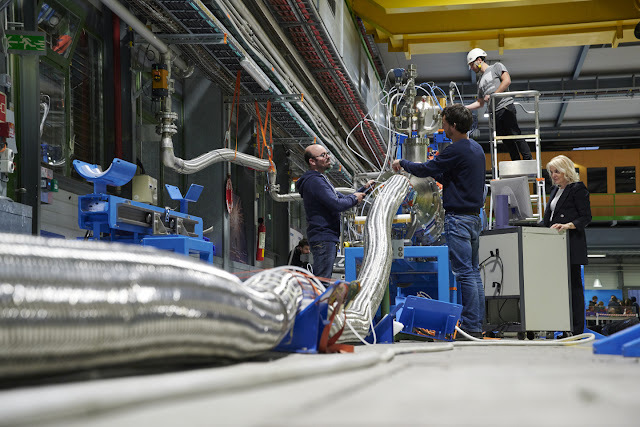 In the High-Luminosity LHC, these lines will connect power converters to the magnets. These converters are located at a certain distance from the accelerator. The new superconducting transmission lines, which measure up to 140 m in length, will feed several circuits and transport electrical current of up to 100 000 amps. “The magnesium diboride cable and the current leads that supply the magnets are connected by means of high-temperature ReBCO (rare-earth barium copper oxide) superconductors, also a challenging innovation for this type of application,” explains Amalia Ballarino. These superconductors are called “high-temperature” because they can operate at temperatures of up to around 90 kelvins (-183 °C), as opposed to just a few kelvins in the case ofclassical low-temperature superconductors. They can transport very high current densities, but are very tricky to work with, hence the impressiveness of the team’s achievement. Tests of the line with its new connection represent an important milestone in the project, as it proves that the whole system works correctly. “We have new materials, a new cooling system and unprecedented technologies for supplying the magnets in an innovative way,” says Amalia Ballarino. The project has also caught the attention of the outside world. Companies are using the work done at CERN to study the possibility of using similar transmission lines (at high voltage), instead of conventional systems, to transport electricity and power over long distances. Founded in 1954, the CERN Laboratory sits astride the Franco–Swiss border near Geneva. It was one of Europe’s first joint ventures and now has 23 Member States. Image (mentioned), Video (mentioned), Text, Credits: CERN/Camille Monnin. 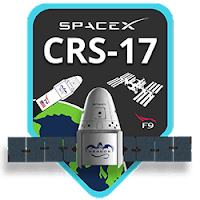 SpaceX - Dragon CRS-17 Mission patch. A SpaceX Dragon cargo spacecraft scheduled to launch in late April takes supplies and a variety of scientific experiments to the International Space Station. Lifted into orbit by a Falcon 9 rocket from Cape Canaveral Air Force Station in Florida, the craft represents the 17th SpaceX Commercial Resupply Services contract mission for NASA. Image above: The SpaceX Dragon cargo craft shown moments after its capture with the Canadian Space Agency’s Canadarm2 robotic arm. NASA astronaut Ricky Arnold controlled the capture as the International Space Station orbited over Quebec, Canada in July 2018. Image Credit: NASA. Read more about some of the scientific investigations traveling to the space station on this launch. The Orbiting Carbon Observatory-3 (OCO-3) examines the complex dynamics of Earth’s atmospheric carbon cycle. Installed on the Japanese Experiment Module-Exposed Facility, called JEM-EF, it collects measurements to quantify variations in a specific type of atmospheric carbon dioxide. Having the observatory on the space station enables sampling during all sunlit hours and targeted local mapping of emission hotspots. 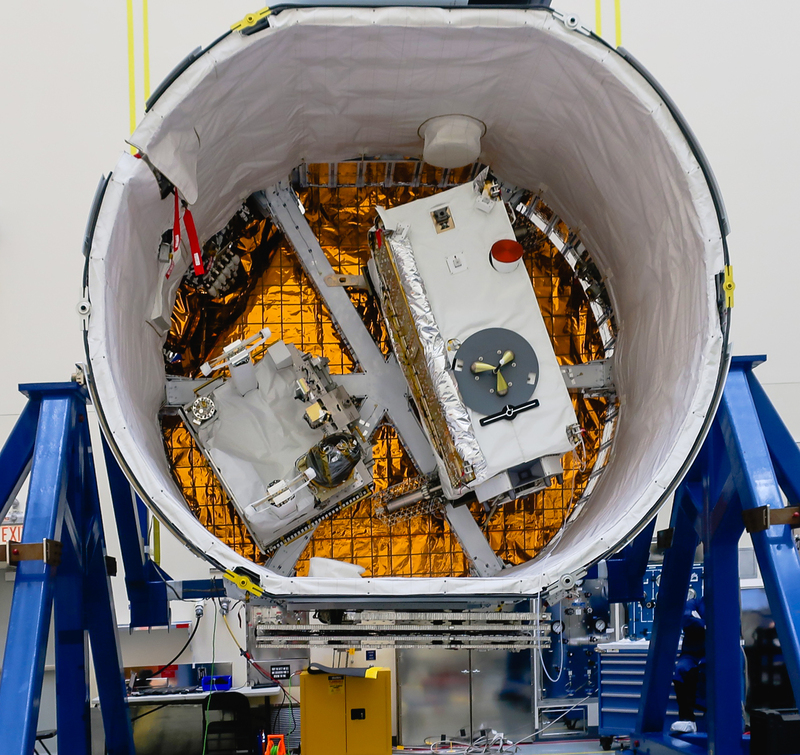 Image above: NASA’s Orbiting Carbon Observatory 3 (OCO-3) and Space Test Program-Houston 6 (STP-H6) shown in the SpaceX Dragon spacecraft at NASA’s Kennedy Space Center in Florida in preparation for launch to the space station. 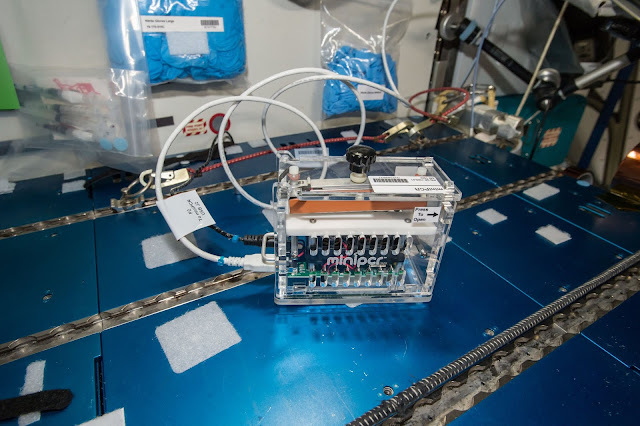 Robotically installed on the outside of the space station, OCO-3 measures and maps atmospheric carbon dioxide to provide further understanding of the relationship between carbon and climate. Image Credit: NASA. OCO-3’s precise measurements will provide scientists with a better understanding of surface carbon dioxide sources and storage sinks on regional scales, as well as the processes controlling their variability from seasonal cycles. Understanding these sources and sinks can help in forecasting increased atmospheric heat retention and reducing its long-term risks. The investigation preserves continuity of previously collected atmospheric records. Current life support systems in space use physicochemical processes, such as steam and chemical reactions, to generate oxygen and water and remove carbon dioxide from the space station. The Photobioreactor investigation demonstrates using biological processes to create a hybrid life support system. The investigation tests the cultivation of microalgae for food and as part of a life support system to generate oxygen and consume carbon dioxide. On future long-duration missions, this approach could reduce the amount of food, water and other essentials that crews have to bring from Earth. This type of research on the station is critical for NASA to understand and overcome the challenges of long-duration spaceflight, and necessary for a sustainable presence on the Moon and missions deeper into the solar system, including Mars. Image above: An example of a Tissue Chip in Space device. These contain human cells in a three-dimensional matrix used in investigations that test how various types of cells respond to stresses, drugs, and genetic changes. Image Credits: NASA Photo/Josh Valcarcel. Image above: The Hermes Facility headed to the International Space Station supports material investigations with applications to asteroids, planetary science, and exploration. Image Credits: NASA/Johnson Space Center. Hermes is a reconfigurable on-orbit facility that provides a platform for investigations with applications to asteroids, planetary science, and exploration. These investigations will provide researchers with insight into the formation and behavior of asteroids and comets, impact dynamics, and planetary evolution. The facility is capable of accommodating up to four experiments at a time and can operate for hours, days, or even months. Hermes is equipped with lighting to illuminate experiments as necessary and four sets of cameras to provide imagery or video for experiment monitoring. Depending on a particular investigation, Hermes may contain different mechanical components and sensors to obtain additional data. Increased exposure to radiation in space can cause damage to deoxyribonucleic acid (DNA) known as double strand breaks. Cells repair these breaks but such repairs are prone to errors, causing insertions or deletions of DNA bases. Buildup of these errors can have detrimental effects, such as cancer, and affect the long-term health of astronauts. Image above: The miniPCR is used for Genes in Space investigations aboard the International Space Station. Spaceflight causes many changes to the human body, including alterations in DNA and a weakened immune system and this technology enables DNA studies in space that can help safeguard crew health. Image Credit: NASA. Genes in Space-6 evaluates the process of DNA repair in the spaceflight environment by causing double strand breaks in the yeast Saccharomyces cerevisiae and assessing the subsequent mutations and repairs while still in space. The Miniature Polymerase Chain Reaction (miniPCR) and the MinION sequencer tools aboard the space station make this assessment possible. Images (mentioned), Video (NASA), Text, Credits: NASA/Michael Johnson/JSC/International Space Station Program Science Office/Melissa Gaskill. 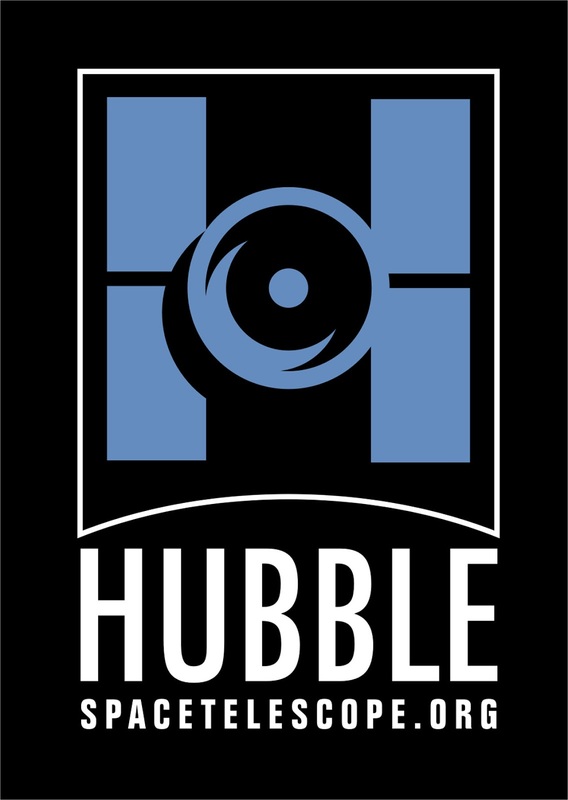 ESA - Hubble Space Telescope logo. This peculiar nebula, which exhibits nested hourglass-shaped structures, has been created by the interaction between a pair of stars at its centre. 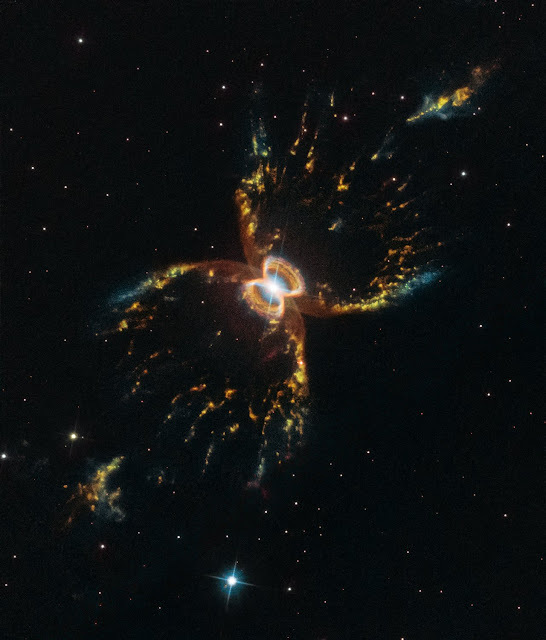 The unequal pair consists of a red giant and a white dwarf. The red giant is shedding its outer layers in the last phase of its life before it too lives out its final years as a white dwarf. 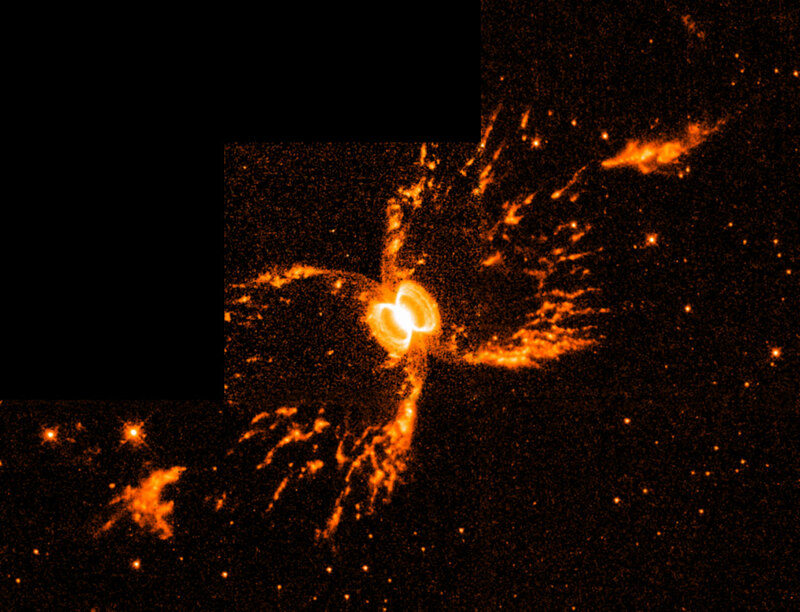 Some of the red giant’s ejected material is attracted by the gravity of its companion. Images, Text, Credits: NASA/ESA/Bethany Downer/STScI/Romano Corradi, Instituto de Astrofisica de Canarias, Tenerife, Spain; Mario Livio, Space Telescope Science Institute, Baltimore, Md. ; Ulisse Munari, Osservatorio Astronomico di Padova-Asiago, Italy; HugoSchwarz, Nordic Optical Telescope, Canarias, Spain/Hubble, M. Kornmesser/Videos: Hubble, DSS, Nick Risinger (skysurvey.org)/NASA, ESA, STScI, ESO/M. Kornmesser. ESA - Planck Mission patch. Scientists have used the tiny distortions imprinted on the cosmic microwave background by the gravity of matter throughout the Universe, recorded by ESA's Planck satellite, to uncover the connection between the luminosity of quasars – the bright cores of active galaxies – and the mass of the much larger 'halos' of dark matter in which they sit. The result is an important confirmation for our understanding of how galaxies evolve across cosmic history. Image above: Gravitational deflection by quasar-hosting dark matter halos. Image Credits: David Tree, Professor Peter Richardson, Games and Visual Effects Research Lab, University of Hertfordshire. Most galaxies in the Universe are known to host supermassive black holes, with masses of millions to billions of times the Sun's mass, at their cores. The majority of these cosmic monsters are 'dormant', with little or no activity going on near them, but about one percent are classified as 'active', accreting matter from their surroundings at very intense rates. 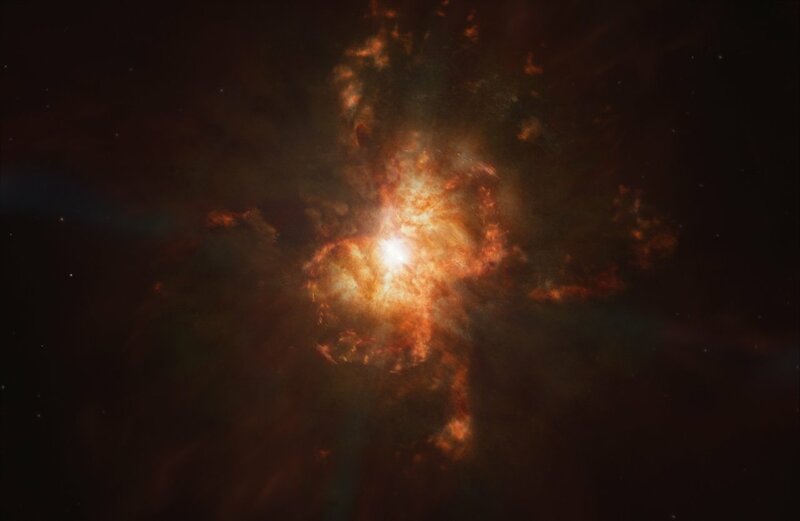 This accretion process causes material in the black hole's vicinity to shine brightly across the electromagnetic spectrum, making these active galaxies, or quasars, some of the brightest sources in the cosmos. While it is still unclear what activates these black holes, switching on and off their phase of intense accretion, it is likely that quasars play an important role in regulating the evolution of galaxies across cosmic history. For this reason, it is crucial to understand the relationship between quasars, their host galaxies, and their environment on even larger scales. In a recent study led by James Geach of the University of Hertfordshire, UK, scientists have combined data from ESA's Planck mission with the largest survey of quasars available to date to shed light on this fascinating topic. According to the leading scenario of structure formation in the Universe, galaxies take shape out of ordinary matter in the densest knots of the cosmic web – a filamentary network, made up primarily of the invisible dark matter, that pervades the cosmos. 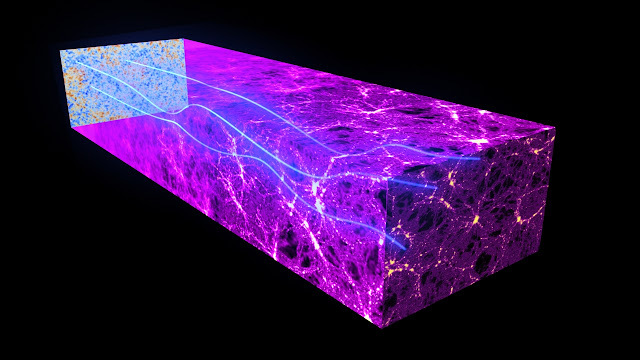 In turn, the complex distribution of both ordinary and dark matter originates from tiny fluctuations in the primordial Universe, which leave an imprint in the Cosmic Microwave Background (CMB), the most ancient light in the history of the Universe. 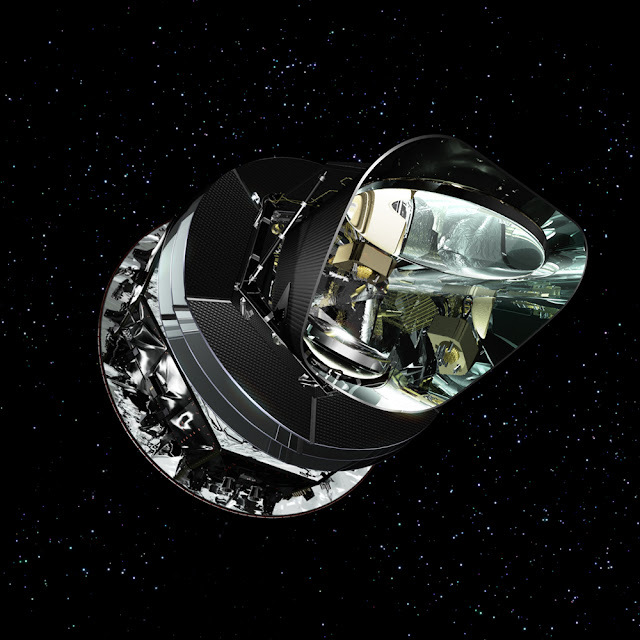 The Planck satellite has been scanning the sky between 2009 and 2013 to create the most precise all-sky map of the CMB, enabling scientists to refine our knowledge of the age, expansion, history, and contents of the Universe to unprecedented levels of accuracy. And there is more: as predicted by Albert Einstein's general theory of relativity, massive objects bend the fabric of spacetime around them, distorting the path of everything – even light – that passes nearby. This phenomenon, known as gravitational lensing, affects also Planck's measurements of the CMB, which carry an imprint of the large-scale distribution of matter that the most ancient cosmic light encountered along its way to the satellite. Image above: Gravitational lensing of the Cosmic Microwave Background. (See also the animated version of this image.) Image Credits: ESA and the Planck Collaboration. "We know that galaxies form and evolve within an invisible 'scaffolding' of dark matter that we cannot directly observe, but we can exploit the gravitational lensing distortions imprinted on the cosmic microwave background to learn about the dark matter structures around galaxies," says James Geach. Gravitational lensing distortions of the CMB are small, rearranging the CMB sky picture on scales of about 10 minutes of arc – equivalent to just one third the diameter of the full Moon. But many tiny deflections from across the sky can be combined, with the help of statistical methods, to obtain a stronger signal, piling up the data gathered around many quasars. In their research, Geach and colleagues analysed the latest gravitational lensing map obtained by the Planck team, made public as part of the Planck Legacy Release in 2018, in combination with 200 000 quasars drawn from the largest sample ever compiled, the more than half-a-million quasars that comprise Data Release 14 of the Sloan Digital Sky Survey quasar catalogue. "By combining the Planck data with such a large sample of quasars, we could measure the mass of the dark matter halos in which the quasar host galaxies are embedded, and investigate how this varies for quasars of different luminosity," says Geach. The analysis hints that that the more luminous a quasar is, the more massive its halo of dark matter. "This is compelling evidence that a correlation exists between the luminosity of a quasar, energy that is released in the immediate vicinity of a supermassive black hole – a region spanning perhaps a few light days – and the mass of the encompassing halo of dark matter and surrounding environment, which extends for tens of millions of light years around the quasar," Geach explains. "We're using the cosmic microwave background as a kind of 'backlight' to the Universe. That backlight has been gravitationally lensed by foreground matter, and so by correlating galaxies with the Planck lensing map, we have a new way to study galaxies and their evolution." The finding supports theoretical models of quasar formation, which predict a correlation between quasar luminosity and halo mass, in particular for the most luminous quasars, where the black holes are accreting matter at close to the maximum rate. The study focused on distant quasars that are observed as they were when the Universe was about four billion years old – about one third of its current age of nearly 14 billion years. This is close to the peak era of supermassive black hole growth. In combination with deeper quasar surveys in the future, the Planck data could enable scientists to push these investigations to even earlier times in cosmic history, up to the epoch when the first quasars formed. 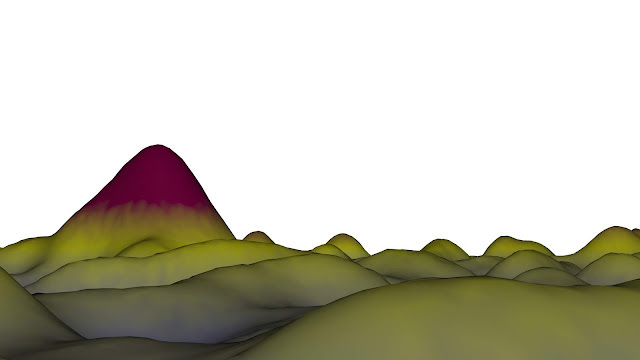 "This result shows the power of Planck's gravitational lensing measurements, which make it possible for us to measure the invisible structures of dark matter in which galaxies form and evolve," says Jan Tauber, Planck project scientist at ESA. 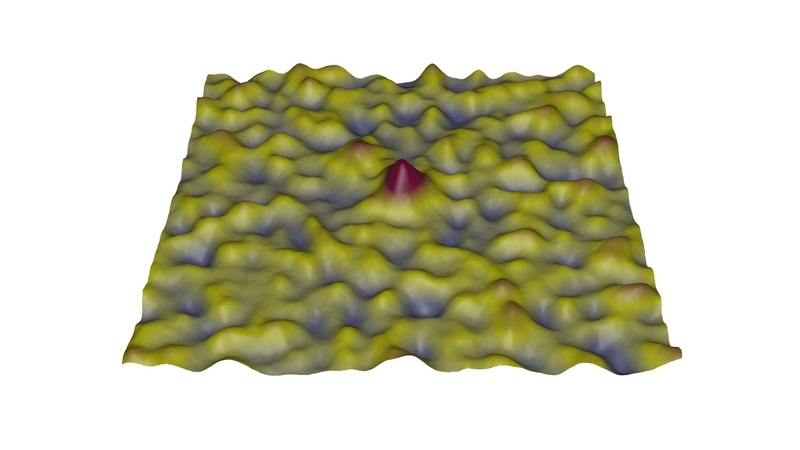 "The legacy of Planck is quite astonishing, with data that are being used for a much wider range of scientific applications than originally conceived for." Launched in 2009, Planck was designed to map the sky in nine frequencies using two state-of-the-art instruments: the Low Frequency Instrument (LFI), which includes three frequency bands in the range 30-70 GHz, and the High Frequency Instrument (HFI), which includes six frequency bands in the range 100-857 GHz. Seven of Planck's nine frequency channels were equipped with polarisation-sensitive detectors. HFI completed its survey in January 2012, while LFI continued to make science observations until October 2013. Images (mentioned), Text, Credit: ESA/Jan Tauber/Centre for Astrophysics Research/University of Hertfordshire/James E. Geach. 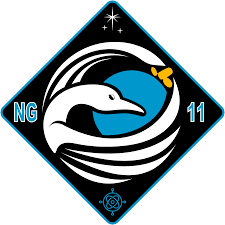 Northrop Grumman - Cygnus NG-11 Mission patch. 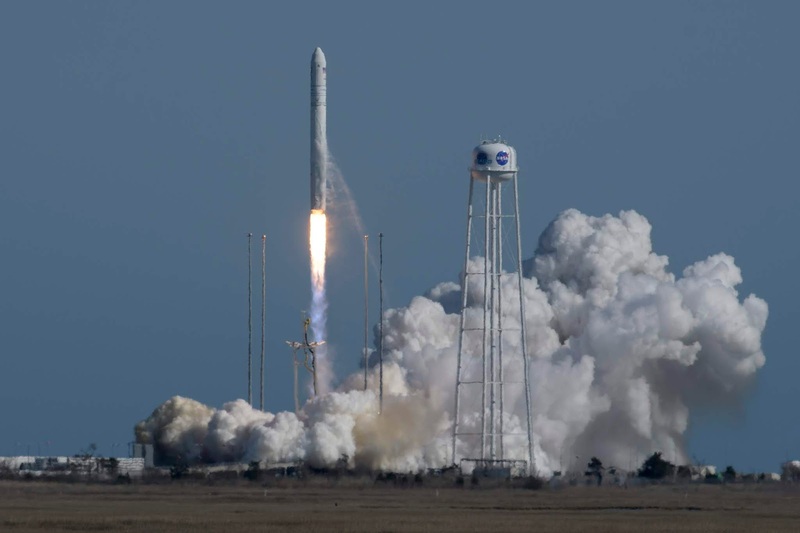 Image above: The Northrop Grumman Antares rocket, with Cygnus resupply spacecraft onboard, launches from Pad-0A, Wednesday, April 17, 2019 at NASA's Wallops Flight Facility in Virginia. Northrop Grumman's 11th contracted cargo resupply mission for NASA to the International Space Station will deliver about 7,600 pounds of science and research, crew supplies and vehicle hardware to the orbital laboratory and its crew. Image Credits: NASA/Bill Ingalls. Expedition 59 astronauts Anne McClain of NASA and David Saint-Jacques of the Canadian Space Agency (CSA) will use the space station’s robotic arm to capture Cygnus, while NASA’s Nick Hague monitors telemetry. The spacecraft will stay at the space station until July. 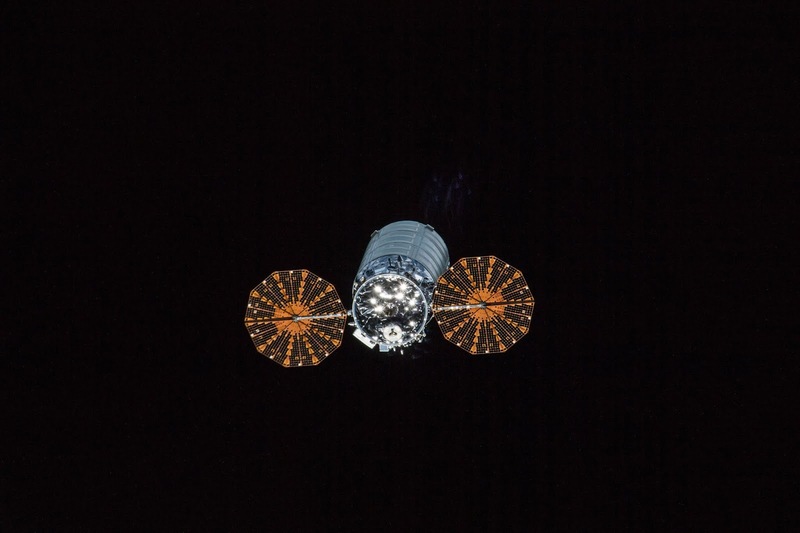 Image above: File photo of a Cygnus cargo spacecraft with UltraFlex solar arrays deployed. This Cygnus was photographed as it departed the International Space Station Dec. 5, 2017, during Expedition 53. Image Credit: NASA. These are just a few of the hundreds of investigations that will help us learn how to keep astronauts healthy during long-duration space travel and demonstrate technologies for future human and robotic exploration beyond low-Earth orbit to the Moon and Mars. Space station research also provides opportunities for other U.S. government agencies, private industry, and academic and research institutions, to conduct microgravity research that leads to new technologies, medical treatments, and products that improve life on Earth. For more than 18 years, humans have lived and worked continuously aboard the International Space Station, advancing scientific knowledge and demonstrating new technologies, making research breakthroughs not possible on Earth that will enable long-duration human and robotic exploration into deep space. A global endeavor, more than 230 people from 18 countries have visited the unique microgravity laboratory that has hosted more than 2,500 research investigations from researchers in 106 countries. Images (mentioned), Text, Credits: NASA/Karen Northon/Gina Anderson/Stephanie Schierholz/JSC/Courtney Beasley. Image above: The Northrop Grumman Antares rocket, with Cygnus resupply spacecraft onboard, launches from Pad-0A, Wednesday, April 17, 2019, at NASA’s Wallops Flight Facility in Virginia. Northrop Grumman’s 11th contracted cargo resupply mission for NASA to the International Space Station will deliver about 7,600 pounds of science and research, crew supplies and vehicle hardware to the orbital laboratory and its crew. Photo Credits: NASA/Bill Ingalls. Loaded with 7,600 pounds of research, crew supplies and hardware, this is Northrop Grumman’s 11th commercial resupply NASA-contracted mission. Launched from Virginia Space’s Mid-Atlantic Regional Spaceport at NASA’s Wallops Flight Facility. Image above: Mission engineers load the final cargo into the Cygnus resupply spacecraft on board the Northrop Grumman Antares rocket, Tuesday, April 16, 2019, at launch Pad-0A. Photo Credits: NASA/Bill Ingalls. Commercial Resupply Services (CRS) NG-11 mission, Cygnus delivers about 3450 kilograms (7600 pounds) of cargo to the International Space Station and is scheduled to arrive on 19 April 2019, at 09:30 UTC (05:30 EDT). 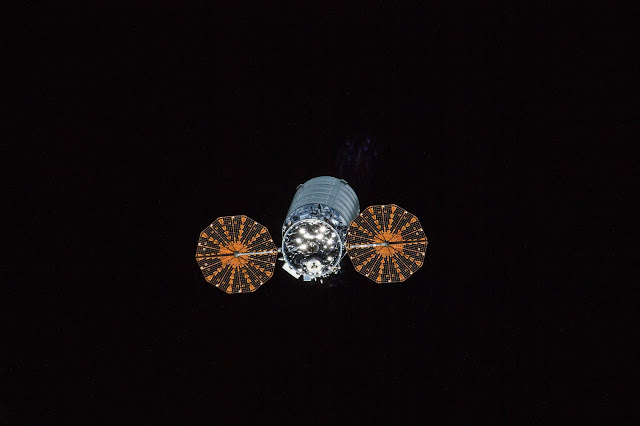 The NG-11 Cygnus Cargo Delivery Spacecraft is named in honor of the American astronaut Roger Chaffe, the pilot of the Apollo 1 spacecraft, the first manned mission of the Apollo program. Images (mentioned), Video, Text, Credits: NASA/Rob Garner/NASA TV/SciNews. Orbiter.ch. Images de thèmes de enot-poloskun. Fourni par Blogger.